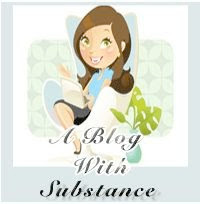 International Woman of Mystery at An International Affair has very kindly passed on the Blog of Substance Award to me. Big thank you to you, mysterious lady. I love awards. Can't get enough. Now, we all know it wouldn't be a blogging award if it didn't make us jump through a few hoops first. Sum up your blogging philosophy, motivation, and experience using five words. And then pass it on to another blog which you feel has real substance. (Actually I'm supposed to pass it on to ten blogs, but you know how I like to break the rules). To Adrienne at The Rich Life (on a budget). SL - I'm looking at you too - now go get some clothes on before the neighbours complain! congrats on your award. totally deserved! i really enjoy your blog. yesterday, i went back to '09 and started reading. have a splendid weekend and take care. Yay! Congrats on your award. I agree, I like the kooky side Le Petit Village. Couldn't imagine it any other way! I love your kookiness and your hilarious stories about 'le petit village' and its cast of characters. And I love that you passed the award onto me. Thank you! I will be sure to post about very soon. And I promise not to be a "Debbie Downer" after this weekend. Congrats on another great award!!! I so laughed when reading about yor motivation; i have been living in (another) Petit Village, only from february though and already before the beginning of the season, all things insane came to my mind...You have a lovely time this winter in your Petit Village! Congrats Sara. I'm off to look at Adrienne's blog. congratulations on the award Sara Louise! Substance... yep, I'd say you've got it. :) Congrats! I know I already wrote une comment, but I had to write again....because I love your new blog header. It's so beautiful. I am jealous of your life in France. I pretend to be French (or sometimes English) just to play along with my fantasies. I would probably be living in France right now actually had i married my ex-french boyfriend. We met in Italy. Oh, l'amour. Take care. I just caught up with like your last 5 posts or something ridiculous....I'm way behind! First, what a gorgeous wedding dress Mrs. Honey B had. Love it. And your trip with Texas Girl was fun, especially as I was imagining moi -- as a Texas girl -- might also some day make it to France and see all the beautiful sites you have posted. And i want one of those cocktails. Or gelatos. Make that and gelatos.